You’re stressed. Your multitasking is starting to produce multi-mistakes, and it feels like you’ll never catch up. Making matters worse, you’re sleep-deprived and feeling lousy. For what it’s worth, you’re not alone—the U.S. is by every measure the most overworked developed nation in the world, with most of us putting in too many hours, not taking vacation, and not taking very good care of ourselves. The solution? Buck the trend and take a break. Decompress. You can avoid rework and actually get more done with a little relaxation. 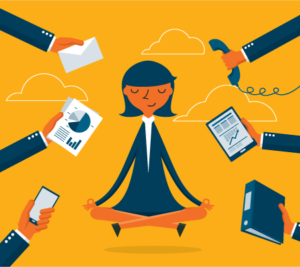 Here are 5 tips for decompressing, destressing, and actually increasing productivity. Change your scenery – One of the most tried-and-true suggestions for getting anything done is to plant your pants in the chair and just do it. This is sage advice, but remember that the chair can be a lawn chair, couch, picnic table, or booth at your favorite café. Chaining yourself to a cubicle doesn’t necessarily spark your creative juices or keep you work focused—and coworkers can be distractions. In fact, telecommuters are almost 15 percent more productive then their office-bound counterparts. So free yourself from your office, and go grab a latté. Sleep – Burning the midnight oil is good for using up oil, but not much else. Rested bodies and brains are simply better at getting things done—and there’s plenty of research to support this. Basketball players who got a solid ten hours at night, for example, saw a nine percent increase in their hoop-shooting performance. Might not sound like much, but imagine if everyone on your team scored even five percent more often—the other team wouldn’t stand a chance. Cap your hours – Beyond 40 hours a week, productivity drops and the risk of accidents increase. Extra sedentary hours behind a desk or stress also increase the risk of depression, weight gain, cardiac issues, high blood pressure, and lowered immune system function. Ask yourself—is it worth it? No one needs these problems and no employer needs the higher rates of absenteeism that go hand-in-hand with long hours. Exercise – It might not sound like relaxation, but putting a little movement in your day can, in many ways, have the same positive impact on productivity. And we’re not suggesting that you have to start flinging tractor tires around with your local CrossFit club—but you should do something. Stretch. Take a ten-minute walk. Just use your body for more than data entry or email. Taking time out to work out still affords you the same—if not higher— productivity, but also results in a greater sense of accomplishment. Say No – Saying yes is easy. It feels good, and we all want to be agreeable—both professionally and personally. But try this little test: imagine yourself on the day of event, outing, meeting, etc., that you’ve agreed to. Do you actually want to do it? Is it something that feeds your passions, recharges you, or moves your work forward in a meaningful way? If not, maybe no is the way to go. Of course, there are unavoidable commitments, but weighing the optional obligations more carefully will free up more time to recharge, take charge, and do what matters most. And if you have trouble saying no in the moment, say, “I need to check my schedule”—and then take the extra time to evaluate. Work smarter, not harder – Make the most of your work day by using tools designed to improve operational efficiency. No matter which department you work in—there are a series of tools and apps to boost productivity and streamline workflow. From marketing automation and call tracking to CRM platforms and team collaboration tools, it’s out there. At the end of the day, who doesn’t enjoy checking off a bunch of items on our ever-increasing task lists? There’s no quick fix to stress. It’s something to be managed, and we’re all fighting uphill battles against a culture that values overwork. But by prioritizing self-care in the day-to-day and by creating flexibility, we can reduce the impact it has on our health, our states of mind, and ultimately, our productivity. Learn more about how CallTrackingMetics is helping businesses around the globe boost productivity through tools like automated reporting and simplified conversion attribution. Often finding yourself under pressure to constantly demonstrate returns on your marketing campaigns? Let us help.